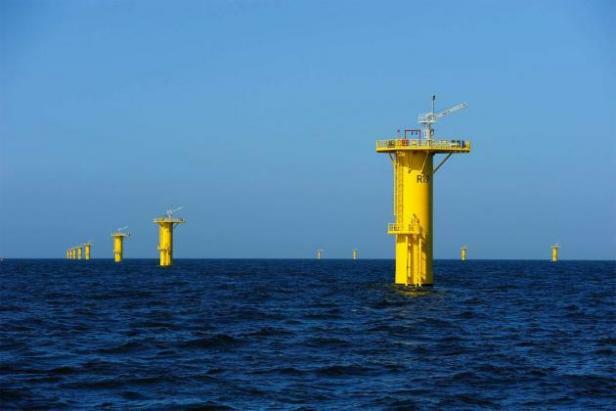 All 30 foundations for the German Riffgat offshore wind farm, planned by EWE Energie AG in conjunction with Enova, have been installed. EWE announced in early September that work on the foundation structures had been completed on schedule. “I am very pleased that we have so successfully accomplished an important and challenging construction step,” EWE project manager Wilfried Hube said. Inner-farm cabling and putting in the foundation for the transformer substation are next, as they need to be done before the substation’s topside and the turbines can be installed next year. The plan is to start the farm up in the summer of 2013. Some 23,000 tons of steel have been used in Riffgat in the approximately 80 days of construction since driving the first piles in mid-June. A total of 200 people were busy at work out at sea in the last few weeks. Each foundation consists of a foundation pile up to 70 meters long and 750 tons heavy that was driven as much as 40 meters deep into the seabed. A transition piece is added to each one that will later connect the turbine tower to the foundation pile. For the first time, a double-walled, tube-shaped soundproof barrier of steel was used when ramming the foundation pile. This was pulled over the foundation pile and had a sound-minimizing layer of air in the outer double tube and a multi-layered adjustable air bubble curtain in the inner tube that also reduces the sound. “The various measurements demonstrated that we came in below the 160-decibel level specified for the protection of marine animals during our pile driving,” reports Hube.